Amazon Kindle Voyage High Resolution eBook Reader Leaked? 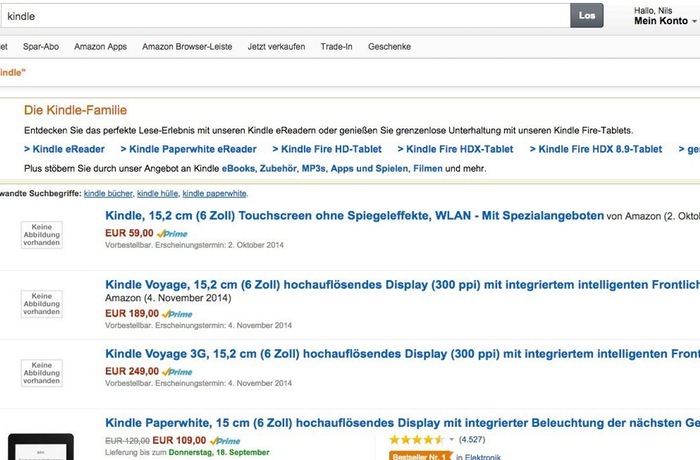 It seems that Amazon may be preparing to launch a new device in the form of the Amazon Kindle Voyage to its range of Kindle eBook readers, if the listing spotted by Caschy’s Blog over on the German Amazon website turns out to be true. As you might expect all mention of the leaked Amazon Kindle Voyage has now mysteriously been removed from the Amazon online store. But if screen shots taken before the leaked information was discovered by Amazon are true the new eBook reader maybe launched very soon. According to the specifications listed on the German Amazon store, the new Amazon Kindle Voyage will be equipped with a higher resolution 6 inch screen offering users a 300ppi front-lit display. Together with a battery that is capable of providing several weeks of use on a single charge. The Amazon Kindle Voyage eBook reader leaked listing also revealed that it is the thinnest Kindle to date and measures just 8 mm in thickness and weighs 6.6 ounces. It was also described as featuring a new navigation that allows users to turn pages by pressing lightly on the screen bezel. The listing on the Amazon site revealed that the new Amazon Kindle Voyage would be priced at €189, but nothing as yet has been officially confirmed by Amazon and no release date was listed. However as soon as anything else is released, leaked or officially announced we will keep you updated as always.